"Worst still, those who were openly abusive about Trump now pretend to be his friend," Nigel Farage, the brazenly anti-immigrant leader of the right-wing Independence Party in Great Britain, wrote Tuesday in Steve Bannon's old rag, Breitbart News. Evidently, Trump knows how to deal with the easily intimidated prime minister Theresa May, who herself had not commented on the composition of a democratically-elected government of an ally. When May's call became the tenth- tenth- taken by the victor following the election, Trump told her "If you travel to the U.S., you should let me know." British Prime Minister Theresa May condemned a blunt speech this week by Secretary of State John F. Kerry on the state of the Israeli-Palestinian conflict, an unusual move that boosted Britain’s relations with the incoming Trump administration at the expense of President Obama. May’s government acted as a key broker between U.S. and Palestinian interests ahead of a U.N. Security Council vote last week to declare Israeli settlement construction “illegal.” British diplomats worked as go-betweens in shaping the measure to ensure that the language was acceptable to the United States, Britain’s Guardian and Israel’s Haaretz newspapers reported this week. Great Britain worked on the resolution upon which the United States abstained, thereby enabling its passage, and which Kerry defended in his apparently offending speech. And Great Britain- as a member (permanent, as it were) of the U.N. Security Council- voted for the measure, days before it criticized the American Secretary of State's speech defending it. we are also clear that the settlements are far from the only problem in this conflict. In particular, the people of Israel deserve to live free from the threat of terrorism, with which they have had to cope for too long. But perhaps the best example of chutzpah- as it would be recognized were the Israeli government not on the opposite side- is May's claim "we do not believe that it is appropriate to attack the composition of the democratically elected government of an ally." Donald Trump took the extraordinary step of publicly recommending the appointment to an office not vacant, British ambassador to the USA. Now P.M. May has given what the Times' describes as "an olive branch both to Netanyahu and to President-elect Donald Trump," individuals who railed against the Obama Administration's failure to veto a resolution actually supported by Great Britain. We are surprised by the U.K. Prime Minister's office statement given that Secretary Kerry's remarks- which covered the full range of threats to a stwo-sate solution, including terrorism, violence, incitement and settlemetns- were in line with the U.K.'s own long-standing policy and its vote at the United Nations last week. They have a right to be surprised; annoyed, even angered. It is a measure of "no drama Obama" that, under the circumstances, his State Department has reacted as calmly as it has. Over the next four years, perspective and serenity will be in short supply in Washington, and Great Britain will find itself among the nations which long for their return. 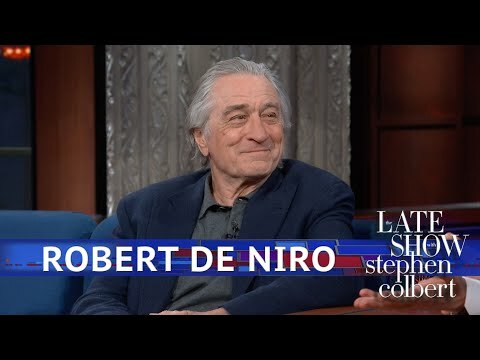 Evidently, she is referring to the likes of Rudy Giuliani, who when asked if Obama was attempting to “box in” Trump, replied "of course he is.” That would be the Rudy Giuliani who once remarked "I do not believe, and I know this is a horrible thing to say, but I do not believe that the president loves America." Otherwise, Conway might argue, Giuliani is just fine with Obama. Or she may be referring to John Bolton, US amabassador to the United Nations under Bush 43. He did maintain on Fox and Friends "what this last burst of activity has to do is hard to say. I do think it's intended to try and box the Trump administration in. I think it will fail." At the same time the Obama-sympathetic Bolton contended "The Russians have walked all over the Obama administration for eight years. It's really been a pathetic performance." Three days earlier, before the President's announcement but after the U.N. vote, he had charged "Obama dislikes American exceptionalism; he dislikes Israeli exceptionalism." Seven months earlier, Bolton had written "Obama’s narcissism, his zeal for photo opportunities with him at the center, whether in Havana or Hiroshima, too often overcomes lesser concerns—like the best interests of the country. He puts his vanity before our nation’s pride,” Big fan. was probably afraid of looking like it was tipping the scale in Hillary Clinton’s favor, especially in an election that her opponent repeatedly described as rigged. Though Obama stumped for Clinton around the country, the administration didn’t want to open him up to attacks that he unfairly used intelligence to undermine Trump’s campaign, the Post reported. Instead, top White House officials gathered key lawmakers—leadership from the House and Senate, plus the top Democrats and Republicans from both houses’ intelligence and homeland security committees—to ask for a bipartisan condemnation of Russia’s meddling. The effort was stymied by several Republicans who weren’t willing to cooperate, including, reportedly, Senate Majority Leader Mitch McConnell. President Obama hesitated in order not to swing the election on the basis of a finding by a consensus of intelligence officials that Putin's allies were trying to move American public opinion toward Trump. Yet, Conway remarks "we can't help think that's often true" that the "motivating factor" is "politics." the decisions that are vital to Israel’s interests and the future of its children (will) be made by the government of Israel around the negotiating table, making them on behalf of the one and only Jewish state, a sovereign nation that is the master of its own fate. Notwithstanding Camus, if Israel were the master of its own fate, it wouldn't be fate, but something else, which illustrates an aspect of the answer to the question of why the American Secretary of State chose to make this speech only on his way out the door. Obviously, the Secretary is clearly setting the Administration on the side of every Administration since President Carter, in contrast to the obvious perspective of the incoming Trump crew. Additionally, however, circumstances have changed, and not because of the USA or Israel's foes. leading towards one state. In fact, Israel has increasingly consolidated control over much of the West Bank for its own purposes, effectively reversing the transitions to greater Palestinian civil authority that were called for by the Oslo Accords. Palestinian structures in Area C that do not have a permit from the Israeli military are potentially subject to demolition. And they are currently being demolished at an historically high rate. Over 1,300 Palestinians, including over 600 children, have been displaced by demolitions in 2016 alone – more than any previous year. The Prime Minister of Israel- similarly to the incoming President of the United States, whom he (currently) adores- seems bent on antagonizing as many people and nations as possible. Ask not, therefore, why Secretary of State John Kerry decided to give this comprehensive speech less than four weeks before he, and the President he serves, leave office. Ask why the Prime Minister of Israel has decided to do what he can to upset the delicate balance which could serve as a bridge toward a final status agreement in greater Israel. Touting Israel as the only country in the Middle East congenial to Christians and urging people to visit, Prime Minister Benjamin Netanyahu offers his wish for a "Merry Christmas. Happy New Year." It's a good bet the American President is not on his Christmas card list. That is still Barack Obama, much to the consternation of Netanyahu and ambassador to the USA Ron Dermer. The Security Council of the United Nations on Friday unanimously (14-0) passed Resolution 234 (2016) blasting "continuing Israeli settlement activities (which) are dangerously imperiling the viability of the two-State solution based on the 1967 lines." Exorcised by the USA's decision to abstain rather than veto the measure, Netanyahu summoned the ambassadors of the 10 of the 14 countries (and later, US Ambassador Daniel Shapiro) with diplomatic relations with Israel... on Christmas Day. Nice touch that. or as a senior diplomat in Jerusalem and a Western diplomat noted "What would they have said in Jerusalem if we summoned the Israeli ambassador on Yom Kippur." Even Terry Pegula waited until two days after Christmas to fire Rex Ryan in Buffalo. While the White House's deputy national security adviser maintained "we did not draft this resolution; we did not introduce this resolution," Dermer claimed he had evidence to the contrary, which he would present to the next Administration. And, you know, when you consider the fact that Ronald Reagan allowed 21 different United Nations Security Council resolutions critical of Israel, including criticizing the bombings of Beirut and the siege of Beirut throughout the 1980s, and Barack Obama had various opportunities during the sieges of Gaza and the bombardments of Gaza that took place under his watch to do so and didn’t, you know, these accusations against President Obama somehow being uniquely anti-Israel really raise questions about whether or not those accusations are not about something else that is unique about President Obama. 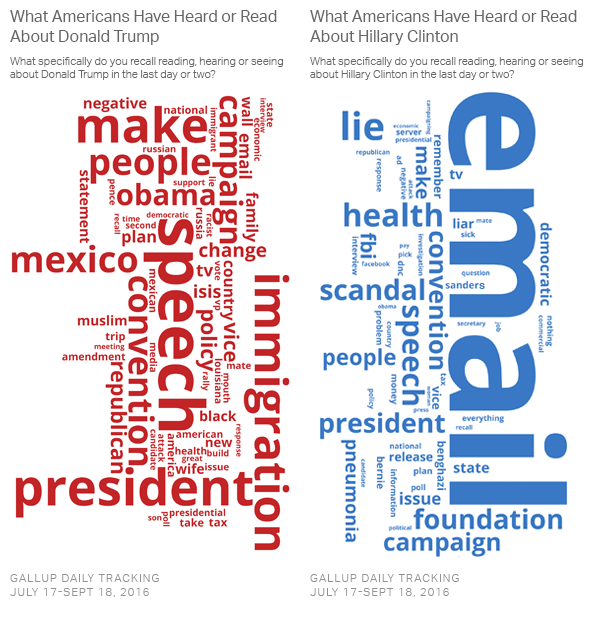 Historians looking through the archives of stories published in November and December of 2016 will find billions of words published on the nature of Trump’s appeal to voters who liked him. These takes, whether accurate or not, are important pieces of sociological exegesis that shed light on the nature of our political debates. But in terms of what actually drove the election result, people who liked Trump were not the key decisions-makers. 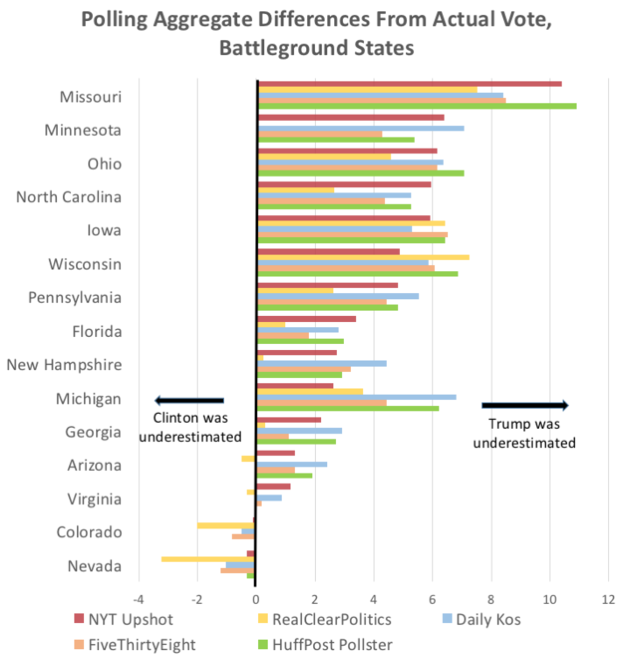 Not only did he lose the national popular vote, but even in crucial swing states he was mostly viewed negatively. Even at the time, some of us found it hardly credible that a decision as weighty as who should be president was being decided on the basis of something as trivial as which email address the secretary of state used. Future generations must find it even harder to believe. 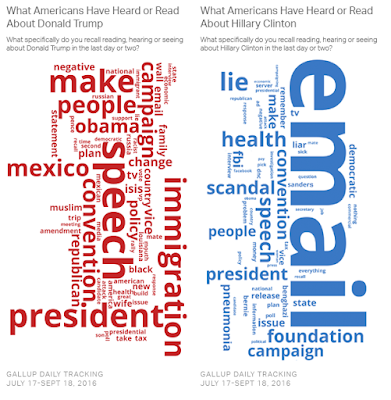 But the facts are what they are — email server management, rather than any deeper or more profound root cause, was the dominant issue in Donald Trump’s successful rise to power. Every argument has its flaw, however, and Yglesias' is a relatively trivial one, and at most, tertiary to his point. Sargent acknowledges "more successful economic policymaking from the Obama administration" might have helped Clinton in the election, He argues, however, that in the "most significant" state of Pennsylvania "Obama had a 51 percent job approval rating in the state. A majority of voters were okay with the incumbent administration...."
The polls proved unreliable. 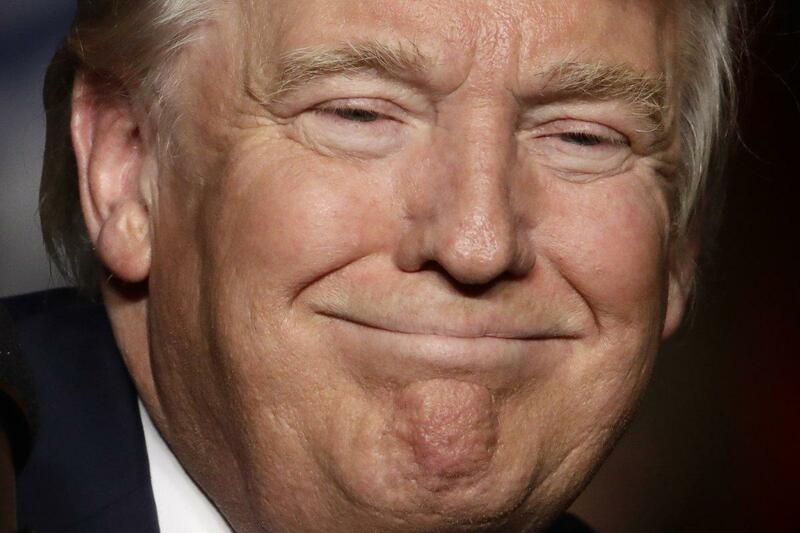 with significant numbers of voters reluctant to admit they would vote for Donald Trump. They did so even though (publicly or privately) they could- more politically correctly- couch their support for him as opposition to Hillary Clinton, as many did, sincerely or otherwise. Compare that to pollsters asking people whether they approve of Barack Obama, whom everyone knows is the first black President, and for many is, above all, the first black President. He polls as 51% favorable. Remarkably, the assumption is that the respondents are telling the truth and, in Yglesias' case, that "a majority of voters" are "okay with the incumbent administration." Okay, yes; pleased, no. 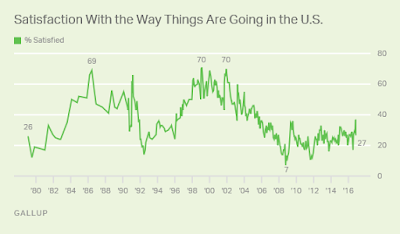 Gallup asked registered voters during the periods of 10/5-10/9, 11/1-11/6, and 11/9-11/13 whether they were"satisfied or dissatisfied with the way things are going in the United States at this time" and found 28%, 37%, and 27% satisfied, respectively. Extrapolating, we can reasonably estimate that on Election Day 2016, approximately 35% of registered voters were "satisfied" with the course of the country. If not constitutionally barred from a third term, Barack Obama, if nothing else a better campaigner than Hillary Clinton, probably would have defeated Donald Trump in what already was a very close election won by an unpopular candidate. However, Trump, one of the original and most dogged of birthers, ran and won with a campaign based on "draining the swamp." Consequently, pundits, analysts, journalists, and others who tell us that President Obama is a popular guy should answer the question: whose swamp is it Americans wanted to drain? The right never wants the public to believe that Republicans are responsible for what's going on in government, even when they are responsible. So conservatives look for scapegoats in and out of politics, and they talk about them as if they have tremendous power. Recall the amount of effort the right invested in denouncing Ward Churchill, a professor who wrote an inflammatory essay in the wake of 9/11. If you paid attention to the right back then, you might have thought Churchill was the most important academic in America. But there are at least two other reasons the organization has targeted institutions of higher learning. After the 2002 election, Bill Clinton famously commented "When people are insecure, they'd rather have somebody who is strong and wrong than someone who's weak and right." The nation now has elected a big guy who admires Sadaam Hussein, Vladimir Putin, Kim Jong Un, Bashar al Assad, Recep Tayyip Erdogan, has said "I alone can fix it," and is wrong constantly and consistently. "Hate crimes" appear to have increased dramatically since the election, and it's no surprise that supporters have been emboldened by the election of Donald Trump. He has not been gracious in victory, and neither will they. Yet one other troubling aspect of the list is that the majority of the supposed heresies didn’t even take place in a classroom, where critics on the right have long insisted that students are indoctrinated with liberal ideas. Many happened on Twitter, during televised appearances, in published op-eds or at political rallies. Twitter is responsible for most (choose one) a) extremist, b) obnoxious, c) offensive, or) all the above remarks. Yet, the list promulgated by Turning Point USA includes, Bunch explains, "several well-known professors with ties to Penn, Temple, and other local schools among its roster of roughly 200 faculty." campus cultures have strictly (if not formally) enforced dogmatic views aboutt he nature of gender, sexual orientation, a woman's right to choose abortion, guns and the role of the state as primary agent of social change. Further, he contends, they encourage "the reduction of all disagreement to racism, bigotry and ignorance- in addition to being wrong about its primary source." Traveling in the world of academe, Camosy is much too polite (or naive) to sugest conservatives are more prone than liberals toward racism, sexism, or class bias. It is out of necessity that the right sends its children off to university, generally the key to professional success. But to most conservatives, it represents much of what is wrong with society, helps explain Anthea Butler's unwanted attention, and why someone must "make America great again." Ariel Dorfman and his wife, we learn in Mr. Dorfman's December 16 piece in The New York Times, were living in Chile in October,1970 when President Salvador Allende was overthrown with an assist from the Central Intelligence Agency and the govenment of Richard M. Nixon it represented. He "can savor the irony" but "feel no glee" now that a foreign power has successfully intervened in an American presidential election. He recommends "an independent, transparent and thorough public investigation so that any collusion between American citizens and foreigners bent on mischief can be exposed and punished, no matter how powerful these operatives may be." as well as "an incessant and unforgiving meditation on our shared country, its values, its beliefs, its history." More critical, less forgiving, and less objectively, Bob Hennelly goes through a litany of sins of the US government over well more than a century of evil-doing. He quotes late historian Howard Zinn, who maintained after having "seized Hawaii, Puerto Rico, Guam, and fought a brutal war to subjugate the Filipinos," from "1900 and 1933 the United States intervened in Cuba four times, in Nicaragua twice, Panama six times, in Guatemala once, in Honduras seven times." Zinn also, Hennelly mentions, describes the "covert domestic network of several hundred professors, administrators and graduate students on over 100 college campuses who acted as eyes and ears" for the Central Intelligence Agency in the post-World War II period. At approximately the same time there was, Hennelly chronicled, Mohammed Mossadegh in Iran in 1953, Fidel Castro in Cuba in the 1960s, "duplicity in the Vietnam War revealed in the Pentagon Papers," and all manner of domestic spying on leftist groups. The history is daunting and Dorfman (to whose op-ed Hennelly links) believes now is the "time for America to look at itself in the mirror, and if ever there was a time of reckoning and accountability, it is now." While Donald Trump’s budding bromance with Vladimir Putin is well known — the two men have exchanged admiring words about each other and called for improved relations between Washington and Moscow — Putin’s hostility towards Clinton draws less attention. Former U.S. officials who worked on Russia policy with Clinton say that Putin was personally stung by Clinton’s December 2011 condemnation of Russia’s parliamentary elections, and had his anger communicated directly to President Barack Obama. They say Putin and his advisers are also keenly aware that, even as she executed Obama’s “reset” policy with Russia, Clinton took a harder line toward Moscow than others in the administration. And they say Putin sees Clinton as a forceful proponent of “regime change” policies that the Russian leader considers a grave threat to his own survival. And one could sarcastically remark "you think?" However, that was in more innocent times, and McFaul was speculating- accurately- at a time when others were unnecessarily cautious. Now, however, it's clear. The ball is in our court, Congress has it, and the implications are dire. A Newsweek reporter who has epilepsy said he had a seizure after being sent a message on Twitter intended to trigger such an episode and is seeking information from the social media company to identify the person responsible for the tweet. The image in question — which included a strobe effect and the words, "You deserve a seizure for your posts" — was apparently sent in response to Eichenwald's outspoken criticism of President-elect Donald Trump. Eichenwald, who has a home in Texas, said in court documents that the image triggered a seizure. Eichenwald told ABC's "Good Morning America" that he has received numerous copycat strobe messages from "people who identify themselves as Trump supporters" and that he is reporting each of them to Twitter to ask that their accounts be suspended. "It is amazing to me that simply because I am a political reporter, simply because I write about Donald Trump that we have become so sick and twisted in this country that people think they have the right and obligation to inflict potentially very serious injury," he said. In the interests of being fair and balanced: tweeters may not be responding only to Eichenwald's latest article. He has been on the Trump corruption beat since well before the election. “I imagine that in the end, nobody was sure they could survive the political blowback if you became president because you flipped the college,” he said. The ambivalence resulted, however, in weeks of agonizing among anti-Trump activists working to flip the Electoral College against Trump. strategy was simple, if virtually impossible to execute: persuade Democratic and Republican electors wary of Trump to unite behind a mainstream Republican alternative such as Ohio Gov. John Kasich or 2012 GOP nominee Mitt Romney. If they could persuade 37 of the 306 Republicans on the Electoral College to ditch Trump, the election would have been thrown to the GOP-controlled House of Representatives in January. She won the popular vote; won it by approximately 2.8 million votes- two percent! Yet, "ambivalence." "The absence of any high-profile support left the ragtag group," Cheney writes, "with little horsepower to counter a well-oiled Republican whip effort, led by Trump campaign operative and the Republican National Committee." The core of the emerging Bush strategy assumes a popular uprising, stoked by the Bushies themselves, of course. Inleague with the campaign- which is preparing talking points about the Electoral College's essential unfairness- a massive talk-radio operation would be encouraged. "We'd have ads, too," says a Bush aide, "and I think you can count on the media to fuel the thing big-time. Even papers that supported Gore might turn against him because the will of the people will have been thwarted." The above was written by Clinton confidante Sidney Blumenthal, which makes it even more remarkable that the campaign appeared to be unaware of this history- and that there might be a split decision in the Electoral College/popular vote in 2016. The failure of the campaign to consider that outcome is less concerning than its possible implication for the possibility of mounting a strong resistance to Trump Administration policies.Call a knife fight, Republicans will bring a machete; Democrats, a kitchen knife. We wouldn't want to be seen as sore losers! In early December, Rep. Bill Flores made what seemed like an obvious observation to a roomful of conservatives at a conference in Washington. Some of Donald Trump’s proposals, the Texas Republican cautioned, “are not going to line up very well with our conservative policies," though he quickly added that there was plenty the incoming president and GOP Congress could accomplish together. Little did Flores realize the hell that would soon rain down from Trump's throng of enforcers. Sean Hannity jumped in, too, featuring the Breitbart post on his syndicated radio show. That only further riled the impromptu anti-Flores mob. "@RepBillFlores get in @realDonaldTrump way & we will burn your career down until you are reduced to selling life insurance,” tweeted one person. "@RepBillFlores you can go hang yourself!!" another wrote. It's a novel form of party message discipline that stems from Trump but doesn't necessarily require the president-elect to speak or tweet himself. Plenty of others are willing to do it for him. Since the election, numerous congressional Republicans have refused to publicly weigh in on any Trump proposal at odds with Republican orthodoxy, from his border wall to his massive infrastructure package. The most common reason, stated repeatedly but always privately: They're afraid of being attacked by Breitbart or other big-name Trump supporters. I have respect for Jeff Bezos, but he uses the Washington Post to have political influence and I got to tell you, we have a different country than we used to have. He owns Amazon, he wants political influence so that Amazon will benefit from it. That’s not right. And believe me, if I become president, oh do they have problems, they are going to have such problems. He’s signaling to the press that he also has the power, whether it’s antitrust or it is the IRS or the FBI or whatever, whatever he is going to be directly or indirectly in command of, he is also signaling to the press that he has that kind of power. private security and intelligence team at his victory rallies, and he is expected to keep at least some members of the team after he becomes president, according to people familiar with the plans. A President with his own private security force? That can be especially effective when you've claimed the media "poisons the mind of the American voter" and your rallies have been characterized by supporters who have "flipped middle fingers and lashed out in tirades often laced with profanity" at journalists who are present. 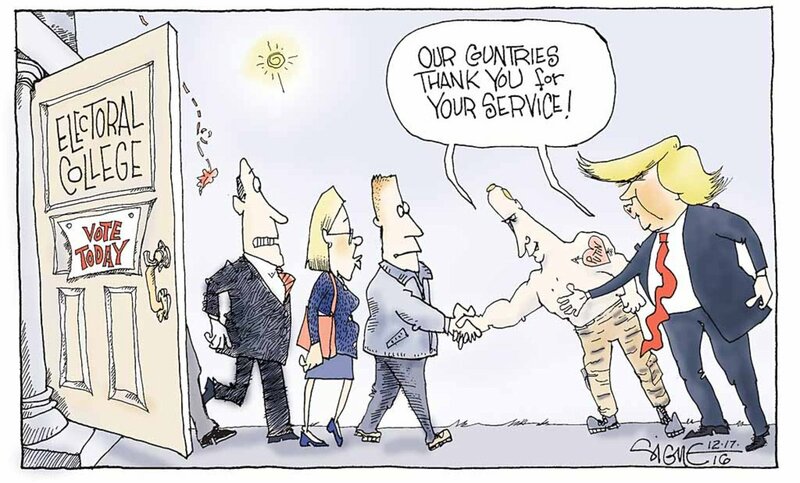 Not yet in power, he has merely asked for "equal time" because he was ridiculed in a comedy skit; significantly, not for himself but "for us," as if all his supporters had been maligned. As a candidate, he developed a blacklist of news outlets and accused The New York Times and The Washington Post of being "dishonest." "They're going to have a lot of problems," he promised, and stated he would "open up our libel laws" so "we can sue them and win lots of money." 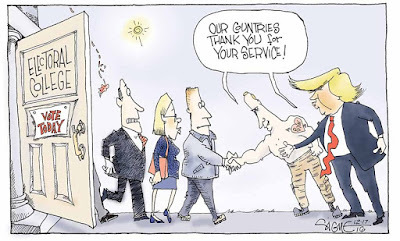 Fortunately, Trump's series of Nuremberg rallies- uh, er, "Thank You Tour"- has ended. However, as U.S. Representative Mark Sanford, wary of the President-elect's propensity to demand unquestioning fealty, has said, "Free speech is one of the hallmarks of our republic. If people are afraid to say what they think based on fear of reprisal.... that's not free speech." Some of it is the prism through which they're seeing the political debate take place. They may know less about the work that my administration did on trying to promote collective bargaining or overtime rules. But they know a lot about the controversy around transgender bathrooms because it's more controversial, it attracts more attention. I think that on something like the Affordable Care Act, you have people who are benefiting right now from Obamacare who either don't know it's Obamacare or consider that as a given and then end up voting on Second Amendment rights. "Second Amendment rights?" After noon on January 20, Barack Obama can be immediately hired by Frank Luntz, for he has adopted the jargon of the anti-gun control crowd. One conservative columnist argues "Support for the Second Amendment is one of the few issues where Republicans on Capitol Hill consistently show backbone" and must continue to "stand firm in defense of the Second Amendment" against Senators who would "decimate the Second Amendment." Donald Trump's campaign website has an entire section entitled not "gun control" or even "gun rights" but "Second Amendment Rights." It begins (however falsely) "The Second Amendment to our Constitution is clear. The right of the people to keep and bear Arms shall not be infringed upon. Period. The Second Amendment guarantees a fundamental right that belongs to all law-abiding Americans." The only right the Second Amendment guarantees is the right to bear arms for someone who is in a militia. Still, "Second Amendment rights" is a rallying cry for the pro-gun lobby, used by the left only defensively, to assure listeners that they are not being critical of the Constitution. Obama's use of "Second Amendment rights" harkens back to November 3, 2010, when he declared Democratic congressional candidates suffered a "shellacking," which further undermined the Democratic Party's credibility, in the previous day's election. A guy who writes a portion of some speeches and is as adept as he at stringing words and phrases together should know "shellacking" plays into the hands of political opponents, and that "Second Amendment rights" could be easily replaced by "gun safety rights" or at least the more neutral "gun control." Either President Obama has a very bad memory or he's blowing smoke up a portion of our bodies.And he always has had a very, very good memory. Well, I'm, I'm not suggesting cooperation at all. Keep in mind that those statements were in the context of everyone now acting surprised by the CIA assessment that this was done purposely to improve Trump's chances. And my only point was that shouldn't be treated as a blockbuster because that was the worst kept secret in this town. The Obama administration on Friday formally accused the Russian government of stealing and disclosing emails from the Democratic National Committee and a range of other institutions and prominent individuals, immediately raising the issue of whether President Obama would seek sanctions or other retaliation. “I moved on her and I failed. I’ll admit it,” Trump is heard saying. It was unclear when the events he was describing took place. The tape was recorded several months after he married his third wife, Melania. The rest is history, with Trump's numbers nosediving- but only temporarily. Russian interference in the election took, generously speaking, a back seat. Q: What were the three most interesting, controversial, or followed stories on October 7, 2016? A: The Access Hollywood Tape, the Access Hollywood tape, and the Access Hollywood tape. When it comes to Russia and coziness, let’s not forget it was Hillary Clinton through her craven foundation requests -- Bill Clinton got a million bucks to give a speech in Russia. And then she turned over 20% of US uranium rights. So let’s be honest about who for money, and who for power, and who for access has cozied up to the Russians. That's one powerful Secretary of State. As explained in factcheck.org when Peter Schweizer made a similar claim in his hit job, "Clinton Cash"
By law, the committee can't veto a transaction; only the president can. According to The New York Times, Clinton may not have even directly participated in the Uranium One decision. Then-Assistant Secretary of State Jose Fernandez, whose job it was to represent the State Dept. on CFIUS, said Clinton herself "never intervened" in committee matters. The "million bucks" Bill Clinton got for a speech in Russia turns out to have been $500,000, and The Wall Street Journal reportedly "found no evidence that speaking fees were paid to the former president in exchange for any action by Mrs. Clinton." That is just remarkable. That is breathtaking. I guess he’s auditioning to be a political pundit after his job is over soon. That is incredibly disappointing to hear from the podium of the White House press secretary. Because he basically — he essentially stated that the president-elect had knowledge of this, maybe even fanned the flames. It’s incredibly irresponsible and I wonder if his boss, President Obama, agrees. Notice, Conway isn’t directly challenging the truth of the allegation, she’s just calling it “remarkable” and “breathtaking” and “disappointing” and “unfortunate” that people mention it in public. That’s how professional liars in Washington do it. What I was concerned about in particular was making sure [the DNC hack] wasn't compounded by potential hacking that could hamper vote counting, affect the actual election process itself. So in early September when I saw president Putin in China, I felt that the most effective way to ensure that that didn't happen was to talk to him directly and tell him to cut it out and there were going to be serious consequences if he didn't. And in fact we did not see further tampering of the election process. According to several officials, McConnell raised doubts about the underlying intelligence and made clear to the administration that he would consider any effort by the White House to challenge the Russians publicly an act of partisan politics. at least two Republicans balked, including Senate Majority Leader Mitch McConnell, who raised doubts about the underlying intelligence and made clear to the administration that he would consider any effort by the White House to challenge the Russians publicly an act of partisan politics. "Recently, the Office of the Director of National Intelligence has received requests from Members of Congress, several electors of the Electoral College and the general public for additional information on Russian interference in the 2016 presidential election," the office said in a statement. President Barack Obama has ordered a "deep dive" on that alleged Russian interference that will be completed before he leaves office on Jan. 20. "Once the review is complete in the coming weeks, the intelligence community stands ready to brief Congress and will make those findings available to the public consistent with protecting intelligence sources and methods," the DNI statement reads. No one believes Donald Trump is going to be denied, or even nearly denied, the presidency when the electors meet on Monday. Nevertheless, they are not bound by law or the Constitution to vote for the individual who prevailed in the states whose electoral votes exceed 269. They ought to know who it is they're voting for and should not be given the privilege of plausible deniability when (if ever) the intelligence community deigns to inform the public. I wanted to make sure everybody understood we were playing this thing straight. That we weren't trying to advantage one side or another but what we were trying to do is let people know that this had taken place. Part of the goal here was to make sure we did not do the work of the leakers for them by raising more and more questions about the integrity of the election right before the election was taking place at a time when the president-elect himself was racing questions about the integrity of the election. If President Obama had set out to lend credibility and prestige to Donald J. Trump, he could not have done a better job. He states "the president'elect himself was raising questions about the integrity of the election." Yet, Trump at the time was a candidate, not a president-elect, the latter an effort to upgrade his status and givinghim credibility for questioning the election's integrity. The President wanted "to make sure everybody understood we were playing this thing straight. That we weren't trying to advantage one side or another but what we were trying to do is let people know that this had taken place. " Nonetheless, to "let people know that this had taken place" would enhance one of Donald Trump's central claims, that the election was "rigged." However, informing the voting public additionally that a consensus of the intelligence community had concluded that the intent of any "rigging" was to weaken Trump's opponent would have increased the range of data available to the public and empowered voters. Instead, the President released limited information, thereby "advantaging" one side, that of Donald Trump and his Party. Unable to predict the pivotal role of the director of the Federal Bureau of Investigation, Obama may have calculated that Hillary Clinton was a strong favorite to be elected, whatever approach the President would take toward Russian incursion into the American electoral process. Obama's approach would undermine the Democratic Party's effort to retake the U.S. Senate. However, even with a Republican Senate (and House), the Affordable Care Act, President Obama's greatest legacy, would be protected from repeal and Obama's legacy largely protected. Were it to have subverted Hillary Clinton's presidency, so be it. One of the disappointments of the 2016 presidential election is that we were deprived of the opportunity of seeing Kelly Ann Fitzpatrick Conway slink back into the sewer she came out from. White House Press Secretary Josh Earnest’s assessment that President-elect Donald Trump may have known about Russian cyberattacks targeting the U.S. electoral process was “breathtaking” and “very unfortunate,” Trump’s senior adviser Kellyanne Conway said Thursday morning. Speaking at his daily press briefing, Earnest referenced a remark Trump made at his most recent formal press conference, held in July, when he publicly invited Russian hackers to search for emails deleted from the personal server of Hillary Clinton. Evidently, it takes very little to take away Mrs. Conway's breath. During the campaign, her boss pleaded "Russia, if you’re listening, I hope you’re able to find the 30,000 emails that are missing.... They probably have them. I’d like to have them released” She is deeply offended- offended!- that the statement could possibly be interpreted as Trump encouraging a foreign power to undermine his nation's electoral system by continuing to hack e-mails of a political party and release them to the public. As she and other members of the president-elect’s team have done regularly, Conway said any suggestion that Russian cyberattacks aided Trump’s win is simply the latest excuse from Democrats upset by the election’s outcome. “I think coming from the podium and basically trying to relitigate a political campaign when the president and the president-elect and their senior staff are trying to work together very closely to have a peaceful transition of power in a great democracy with just about a month plus ago, I find it to be very unfortunate,” Conway said. it's challenging to know with any certainty what did and did not move votes. What's more, the election was so close in the three crucial swing states that essentially anything could have been the difference maker. It does seem, however, that Clinton was hurt very badly by late-breaking revelations from the FBI that it had uncovered new emails related to the investigation into her private email server — emails that later turned out to be irrelevant or duplicates. But there was something more insidious in Conway's remarks than her feeble attempt to refute the notion that the emails influenced voters. The well-spoken Conway, carefully choosing her exact words as always, claimed (emphasis mine) "he essentially stated that the president-elect had knowledge of this, maybe even fanned the flames." There was ample evidence that was known long before the election, and in most cases long before October, about the Trump campaign in Russia, everything from the Republican nominee himself calling on Russia to hack his opponent. It might be an indication that he was obviously aware and concluded, based on whatever facts or sources he had available to him, that Russia was involved and their involvement was having a negative impact on his opponent's campaign. Earnest did not "essentially state" Trump knew. He stated it "might be an indication," which, given the facts known, is far less accusatory than it could have been. More significantly, Earenest referred to the pre-election period, when the individual was candidate Donald J. Trump running for political office. He was not President-elect Trump, eleccted by the American people (albeit without a plurality of the vote) to be their next President. It is a crucial distinction, given the greater credibility and legitimacy of someone given the nod for President rather than a candidate spinning every which way in order to win an election. The choice of "President-elect" rather than Trump or- the more precise "candidate Trump"- was not accidental. Kellyanne Conway knows the distinction and spoke accordingly in order to de-legitimize the words of the President's spokesman. And there should be little doubt where the truth lies when considering her words against those of someone who is, well, Earnest. Politico's Edward-Isaac Dovere details the infighting among the Clinton camp, organized labor, the DNC, and state organizations in the Midwest which contributed to triumph on November 8 for someone clearly unqualified, corrupt, and misogynist. Ultimately, Clinton did not win because she failed to win in either Pennsylvania or Florida, which states she lost narrowly, but whose results do not appear to have been brought about by a dysfunctional campaign. Without victory in one of those states, the Democrat could not have prevailed, even if she had carried Michigan and Wisconsin. Sanders threw himself into campaign appearances for Clinton throughout the fall, but familiar sources say the campaign never asked the Vermont senator’s campaign aides for help thinking through Michigan, Wisconsin or anywhere else where he had run strong..... People who asked for Vice President Joe Biden to come in were told that top Clinton aides weren’t clearing those trips. It was already November when the campaign finally reached out to the White House to get President Barack Obama into Michigan, a state that he’d worked hard and won by large margins in 2008 and 2012. On the Monday before Election Day, Obama added a stop in Ann Arbor, but that final weekend, the president had played golf on Saturday and made one stop in Orlando on Sunday, not having been asked to do anything else. Michigan senior adviser Steve Neuman had been asking for months to get Obama and the first lady on the ground there. According to Dovere, internal numbers from Clinton's campaign headquarters in Brooklyn, NY showed the Democrat ahead by five points in Michigan on the morning of November 8. Nonetheless, by early afternoon, campaign headquarters found "urban precincts" (were) down 25 percent. Clinton lost Pennsylvania the following day, by a little more than she lost Michigan, in what everyone- no matter other disagreements- agrees was a "change election." Massive amounts of people fed up with "Obamacare" and believing the country was on the "wrong track" rather than the "right track" either rushed to the polls to vote for Donald Trump or were adequately disillusioned not to vote for either major party candidate. Gallup polls imply that President Obama had a 56% or 57% approval rating on the day of the election. 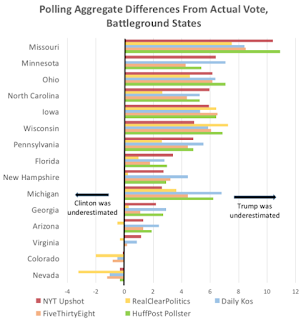 However, reliable polls also suggested that Clinton would win the national popular vote by more than she did, and state polls had her running significantly stronger in such swing states as North Carolina and Florida, as well as the aforementioned Pennsylvania, Wisconsin, and Michigan. And those polls were not asking people what they thought of the first black President, whose election some voters insist proved that America is not "racist." Amidst all the explanations- and there are a lot, mostly legitimate, of them- of Trump's victory, there is one missing. President Obama may have ultimately damaged Mrs. Clinton's chance of prevailing in a "change election." Clinton grabbed hold of President Obama, hung on tight, and lost a race that could not be lost. Hillary Clinton may have done better acknowledging the problems with the Affordable Care Act and aggressively promoted solutions. She might have acknowledged the long-term decline of the middle class and emphasized the importance of unions (which President Obama has failed to do) in maintaining an adequate standard of living. She could pointed to the role of free and unfair trade pacts, promoted by the incumbent President, in the loss of American jobs. It might not have worked, and would have been a major gamble in a race she was heavily favored to win, and very likely would have in the absence of voter suppression, voting irregularities, and GOP operative Jim Comey. 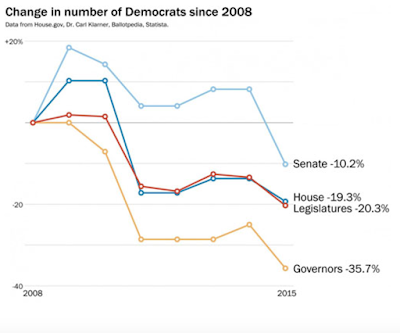 However, as people point to Hillary Clinton as representing the political establishment and embodying the status quo, they ought to admit that the popularity of the incumbent Democratic President may not only not be transferable, but may be highly overstated.